You spent hours agonizing over the cutest, most practical, absolute best diaper bag. And for good reason: this utility bag will basically be your life support for the next two to three years of errands, adventures, and anything else you do with baby in tow. Now to pack it smartly with the essentials. Here are 10 things you won’t want to leave home without. If you’re not already, you’re about to become a major germophobe. After all, you have a tiny, immature immune system to protect! Stash a hand sanitizer in your bag for the times when you can’t wash your hands. This one’s obvious, but kudos to you if you make it through your child’s diaper years always prepared for blow-outs and diaper disasters. The key of course is to restock your bag frequently. A diaper bag with three diapers and at least a half package of wipes should be the goal at all times. You might not ever need to change your baby’s clothes while you’re out, but like so many things baby, the extra outfit follows Murphy’s Law: pack it and you’ll never use it, leave it out of your diaper bag and your little one is sure to have a massive, up-the-back-and-everywhere blowout. Don’t risk it, mama! Keep a protein bar or dried fruit and a bottle of water in your bag for those times when hunger hits and you need a boost of energy. Breastfeeding mamas in particular need to stay hydrated, so sip and refill frequently. Eventually you’ll also start toting finger foods and toddler snacks, so gear up for the Goldfish crackers soon. If you do baby outfits that require socks (as opposed to the footie pants and bodysuits), you’ll benefit from having a back-up pair or two in your bag. They tend to fall off or otherwise disappear, and no baby is happy with cold tootsies! Changing tables in malls and restaurants usually have a spot to stock paper table liners, but good luck finding one that actually has some! 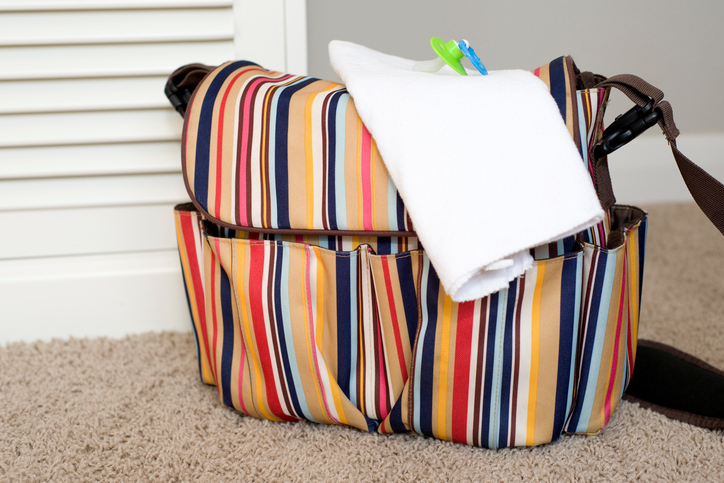 You’re better off to keep a foldable changing pad in your bag. That way you’ll always have a layer between your baby and the not-so-clean table. Pacifiers are another small baby necessity that tend to go missing—or fall and hit the filthy ground—often when you need one the most! Pack one or two extras in your diaper bag if you find that your baby is soothed by them. Some moms also like to use wipes specifically designed to clean off pacifiers. Depending on your level of comfort with breastfeeding in public, a nursing cover like this one from Bebe Au Lait can be a godsend. It just pulls over your head, and has a wire at the top to hold the fabric away from your baby and allow you visibility. If you prefer, a baby blanket can do the trick as well. Tuck both into your bag before heading out. Diaper rash can wreak some major havoc on a baby’s sweet bottom. Be prepared with a small tube of your preferred preventative diaper cream in your tote. Because again, the times you don’t have it are the times when you really need it. Babies can teethe for months before a single tooth appears, and in that time they love to chomp and chew on anything that will soothe their sore gums. Throw one or two in your diaper bag. They'll also serve as distractions and playthings when your little one needs to be occupied while you're out.